The resolver-to-digital converter MSX-RDC-17 is a device for supplying and acquiring a resolver. It converts the position value given by the resolver into a digital incremental output signal. 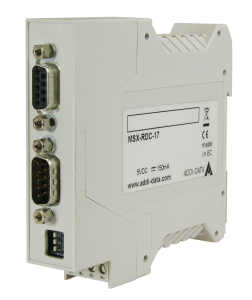 The resolution of the incremental encoder output can be defined using the switch on the front side of the MSX-RDC-17. The resolution of the incremental output is set through a switch panel on the front side of the MSX-RDC-17. Signal noise and conversion errors can vary and thus impact the precision of the interpretation. By using the MSX-RDC-17, you are flexible in case the selected resolution was not sufficient. Available resolutions: 10-bit, 12-bit, 14-bit and 16-bit.